Hud kept our spirits up during the long, awful day by playing his uke and singing. It has taken me a few days to process what happened to us on our sail from Luperon to Samana. Even now, I don’t really feel like writing this, I’d rather just forget it ever happened. But it happened, and it’s part of our story, and I know I won’t feel right if I don’t include this on our blog. The sail from Luperon to Samana is considered by many to be the toughest in the Caribbean. It’s a 24 hour trip (which we broke up into 2 days), and for the duration of it you are headed east, directly into the trade winds. Because you are going against the wind, this is primarily a motoring trip (solely sailing is not a really a possibility, unless you beat upwind the entire way, which would take five times as long). We chose a weather window that was ideal for motoring, no wind. The trip is kind of treacherous- rocky coast is on one side of you, the wide open sea with big swells on the other. There are only a few places where stopping or anchoring along the way is an option. There are two large capes (jutting horns of land) you must get around, and the seas can get rough around them. We waited for an ideal weather window and we lucked out with a great one. We had worked for many days prepping Moxie for this trip, checking all of her systems, getting all ducks in a row. Our crew felt ready. We sailed at night, when the trade winds die down. We left Luperon at 10 pm on the first night under a starry sky. At about 4 am, out of nowhere, the engine mysteriously died. Trav switched fuel tanks and replaced a fuel filter, and our engine started again. We figured it had just been a fuel filter issue, no big deal. We reached the anchorage in the morning and rested, preparing for the following night, which would be the second, sketchier and much longer leg of the journey. It was a crazy, messy, difficult job, setting up those jerry cans full of diesel at the as the boat rocked and pitched in the swells. Trav was dripping sweat, working furiously to set up the emergency fuel system to get us going again. With nothing to power us, Moxie was in danger of drifting, so I tried to sail her as best I could, in the pitch black night with only 5 knots of wind. I couldn’t keep on our course (which was headed directly into the wind), so I tried to tack (sail in a zig zag) to at least keep us moving forward and in the right direction. I had never done this by myself. I didn’t do it well. At this point, it was 5 am. My head was spinning. I messed up tacking and ended up turning the boat totally around. Now we were going the wrong way. Trav leaped up to the cockpit to help me. He looked me directly in the eyes and said, “You have to do this. You have to do it right. You have to do it now. You know how. Slow down, figure it out. DO IT.” He also made me drink a half a bottle of Five Hour Energy. (Have you ever tried this stuff?!? It was my first time. Holy crap, IT WORKS. My head woke up. My eyes woke up. I was capable again. I am a BELIEVER in 5 Hour Energy). The kids were awake at this point. I tried my best to keep my face and my voice totally void of the fear I felt. I sang songs, I cracked jokes, I told stories. 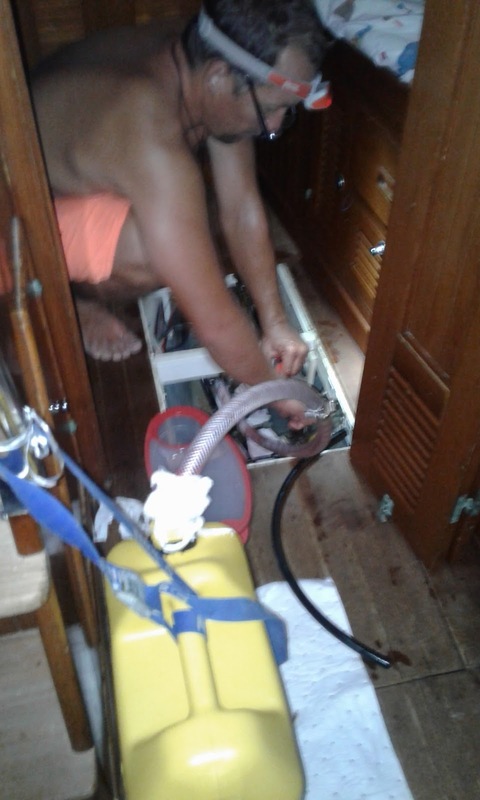 I sailed the boat as Trav worked hard, switching fuel cans and bleeding fuel lines. He had to keep sucking diesel to prime the lines when he switched them and every time he did so he would feel so nauseous he’d have to come up on deck and breathe fresh air before going back down in the cabin again to work more on the makeshift fuel system. Our living space was splashed with diesel. Everything reeked of fuel. For Hud and Viv, this awful day meant sitting in the cockpit for almost 12 hours with nothing to do. Although we kept our heads and tried not to let them know how stressed we were, they knew what was happening. And they were amazing- they stayed calm and never once complained. The tanks were bone dry. Our fuel had been stolen in Luperon. Someone had taken all of our diesel. The diesel hadn’t been contaminated as we’d thought, the filters were getting clogged because the gas going through them was the sludge from the very bottom of the mostly empty tanks. Someone, during the 7 months Moxie sat in the Luperon harbor, had siphoned out our 180 gallons of diesel. Moxie doesn’t have a fuel gauge, so we just keep track of how much we buy and how much we’ve used by how many hours we've traveled since we last fueled up. We should have had 180 gallons of fuel in our tanks. But we didn’t. We had zero gallons. And we were 15 miles now from Samana. On a sailboat that averages 7 miles per hour at top speed with decent wind and a fueled motor, 15 miles is a long haul. With no wind and no fuel, 15 miles is like going to the moon. And at this point we were nearing the cape, the sketchiest part of the sail with the most unpredictable seas. In the meantime, I was using our InReach satellite device to send a text message to our sailor friends who were already in Samana. I told them we were on our way via dinghy power but could they please try to bring us some diesel. At this point, we were about 12 miles away. It was 1 pm. We have been incredibly lucky to make wonderful friends on this sailing journey. I was never more appreciative of this than I was when our friends Trent and Kevin from SV UpsideUp and SV The Kraken responded to our satellite message and immediately made preparations to come help us. They got a boat from the marina, stocked it with snacks, beer and emergency gear, and set out in the huge swells, late in the day, to bring us the diesel we needed. They reached us at about 3 pm. The sight of them made me teary. Superheroes Trent and Kev took the weary but resilient Hud and Viv on their boat, fed them junk food and cheered them up. I was so, so grateful for that. My kids were troopers through the entire ordeal, and I was so relieved that they were safe and in good hands. Trav and I put the new diesel into our tanks, and poor Trav had to prime the fuel lines once again (more diesel in the mouth). It took over an hour to get Moxie’s engine started again. When I heard the engine finally start, I was too exhausted to even be happy. I felt depleted and drained and disheartened. I felt sad and miserable. We motored the final leg of the trip, passing gorgeous cliffs and stunning vistas without noticing them. We were a silent mess. In a million years, it never occurred to us that someone would steal from us in this way. I can imagine what the thief might have thought, how he or she might have justified this theft. We get it- we are the haves, there a lot of have nots in this country. It would have been great to have received a note that said something like, "I stole your fuel, it helped my family. Your tanks are empty, FYI." Perhaps the thief was desperate, and maybe by taking our $900 of fuel, this person was able to save himself in some vital way. I guess I hope that’s the case. But I can only pray that the thief did not have enough sailing knowledge to comprehend the danger he put my family in by stealing our fuel. If ANY component of the trip had been different, if a squall had come up or if the north swell had increased, or if our friends hadn’t been able to help us, this story might have had a very different ending. We were so, so lucky. My stomach can barely handle the thought of how my children were put in danger. I am proud of how we handled that frightening experience. I am proud of my unflappable, positive kids, who never complained throughout that terrible night and day. I am unspeakably proud of my genius husband who came up with solution after solution after solution. I guess I’m proud of myself for keeping my cool. But I would be lying if I told you that this experience hasn’t tainted my feelings about sailing a bit. It’s still fresh, we are still raw from it. It was the most difficult part of our journey thus far. Oh dear moxie crew. I cried and felt with you all reading about this part of your trip. Thanks for sharing also these harrowing details of your journey. I hope that you will be able to get a fuel gage on your boat. So weird that it did not have one. May this leg of your trip make you stronger. I am proud of you all too. Way to handle this emergency! Thank you, dear Universe, for keeping my friends safe on their journey. I love you guys! Incredible! We are so happy to hear a fairly happy ending to this part of your trip! But WOW!!!! So glad you are all safe and sound! I can only imagine the thoughts going through your head trying to protect the kids. You are safe now!